Mulligan and Stephen are having some fun at Haines’ expense. Haines has come to Ireland, (as we will shortly learn) on some sort of research trip having to do with Irish culture. He’s the foreigner, the colonizer, who has come to make his name collecting and publishing the sayings of the natives. We’ll also learn in a moment that he’s the only person in the tower who can speak Irish. But more on that later. Mulligan’s and Stephen’s joke, such as it is, turns upon the idea that the Irish culture they know consists of dirty and profane songs, snippets, nothing worthy of the title of a national epic. Just the “cracked lookingglass of a servant,” written in the master’s language. Given Joyce’s disregard for the distinctions between high and low culture, and given his love of the real songs and phrases and practices of a city’s streets, it’s not hard to imagine that he would say a real collection of Irish culture would be the Mother Grogans and Mary Annes (and Molly Malones, while we’re at it). And if you wanted to be extra cheeky about it, you could call that work Ulysses. 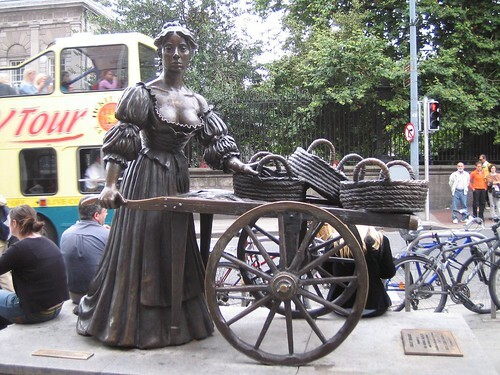 Reader's Guide Haines, Mary Anne, Molly Malone, Mother Grogan, Mulligan, songs, Stephen. permalink.